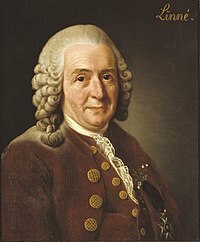 общепринятое сокращение имени ботаника: L.
English: Carl Linnaeus, widely known by the Latinized name Carolus Linnaeus (May 23, 1707 – January 10, 1778), aka Carl von Linné, aka Carlos Linneo, was a Swedish botanist who laid the foundations for modern biological nomenclature. Cover of Systema Naturae, 1st edition (1735). Cover of Systema Naturae, 11th edition (1760/MDCCLX), printed in Germany. The Animal Kingdom, from the first edition of Systema Naturae (1735). Page of Systema Naturae (6th ed., 1748) relative to Quadrupedia. Page 105 of Systema Naturae, 13th edition (1767), printed in Vienna. Page 837 of Systema Naturae, 10th edition (1758), explaining the sexual system. Cover of Species plantarum (1753). 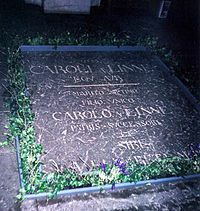 Epitaph of Carolus Linnaeus, Uppsala Cathedral. Statue by Johan Niclas Byström in the Uppsala Botanical Garden, photographed while temporarily placed in Carolina Rediviva. Royal Botanical Garden, Madrid (Spain). Real Jardín Botánico Juan Carlos I, Alcalá de Henares (Spain). Эта страница в последний раз была отредактирована 1 декабря 2018 в 10:27.